It's been three weeks since I returned from Haiti and a fortnight since Hurricane Matthew made landfall along the southern coast of the Caribbean island, bringing its category-5 devastation to the poorest nation in the western hemisphere. And in the time that has passed since my first visit to Ayiti (as they say in Creole), I can't stop thinking about her. Not the demure yet mighty woman named Josef, a 49-year-old farmer and mother of 12 from Haiti's Central Plateau region, who gave birth to her first 11 children at home. It wasn't until varicose veins compelled her to seek medical treatment at a local USAID-funded Project Medishare clinic that she learned about contraception and family planning. Josef delivered her youngest child, now age 7, in a hospital and then underwent a tubal ligation. Given the choice, she wasn't interested in expanding her brood to a baker's dozen. Not Raphael, Josef's fiercely bright 21-year-old daughter, whose first child died in infancy, and who now gets quarterly injections of Depo-Provera so she can decide when or whether she wants to become pregnant again. Haiti has one of the highest fertility rates (3.5 babies per woman) and at maternal mortality rate (359 per 100,000 live births) that is the worst on this side of the planet. Not Chantal, the soft-spoken, exhausted mother of two-month-old baby Jackson from the Delmas 32, perhaps the commune (neighborhood) of the capital city Port-au-Prince most damaged by the 2010 magnitude-7 earthquake. Nearly seven years later, most of the rubble has been cleared and many repairs made in Delmas 32, but we still had to step carefully (several of my traveling companions slipped and fell) as we made our way through the steep-and-narrow lanes to Chantal's back yard, where the new mom (a beautician by trade) listened patiently as a community health agent from J/P Haitian Relief Organization (J/P HRO) talked about breastfeeding and infant nutrition while our delegation of journalists, philanthropists, activists, and others observed. Not Destine, the 28-year-old wife of a voodoo priest and mother of four young children, who told us about her plans to have her tubes tied. She appeared to be as skeptical as the rest of our delegation when a community health agent extolled the virtues of what most of us might call the "rhythm method" while her youngest child, a baby boy, napped nearby on a grass mat in the shade of a pistache tree. I wish I'd snapped a picture of her world-class side-eye when a health official mentioned vasectomy as another viable family-planning option. (So far, we were told, precisely one man has taken advantage of the free vasectomies offered by the nearby clinic.) Meanwhile, there's a waiting list for tubal ligations. Not the dozens of women--some babes-in-arms mothers, some married, some single, and more than a few young women standing on the threshold between adolescence and adulthood--and a few men, too, waiting in long queues to meet with health counselors on what turned out to be World Contraception Day (Sept. 26) at the Medishare clinic in the Central Plateau town of Marmont, about two hours north of Port-au-Prince. Marmont, where fully a third of children under the age of five suffer from chronic malnutrition, is mostly unremarkable but for one disturbing statistic: before the 2010 earthquake, the mortality rate for children under five was 187 per 1,000 births--the highest in the country. Not the scores of mothers with children who lined the corridors and courtyards of the GHESKIO Hospital in Port-au-Prince. Some had come so their kids could receive vaccinations that protect against diphtheria, tetanus, whooping-cough, hepatitis B, and a kind of influenza that causes pneumonia and meningitis. But others had brought their children to GHESKIO for treatment in its pediatric AIDS unit. As we walked the grounds of the hospital, one of the doctors said something that stopped me in my tracks: The busiest HIV clinic in the Americas --in the Western Hemisphere--is a pediatric clinic in Port-au-Prince. Founded in 1982, GHESKIO was the first health care institution in the world dedicated to the fight against HIV/AIDS. And Haiti's HIV/AIDS programs are among the most successful anywhere. The HIV-infection rate is just 1.7 percent overall--that's about 130,000 people living with HIV--but each year GHESKIO's pediatric AIDS department still sees about 800 babies, the majority of whom receive pharmacological treatments that prevent the transmission of HIV from mother to child. Not Dr. Marie Marcelle Deschamps, GHESKIO's passionate, indefatigable general secretary--the heroic physician who, for 33 years, never has looked away or allowed anyone else the luxury of doing so if she could help it. A native of Port-au-Prince, as a young woman Deschamps went abroad to study. "I returned in 1982 and I said I will never leave again," she told us, adding that about 80 percent of Haiti's "trained human resources," i.e. physicians and other professionals, flee the beleaguered island nation, never to return. "If you stay, you are an optimist," she said. The optimistic doctor has helped GHESKIO evolve into a center for comprehensive health care--particularly for Haiti's most vulnerable women. The Port-au-Prince metropolitan area is about the same size as Chicago, with a population of 2.6 million and no sewer system. Today, GHESKIO is flanked by The City of God and The Eternal City--massive slums that an estimated 200,000 Haitians call home. Deschamps recalled how, as a child, she would ride bicycles with her father along Le Boulevard Harry Truman, a central thoroughfare through the capital city that runs in front of the hospital. "Can you imagine?" she says to the latest assembly of sweaty, well-intentioned visitors to her busy hospital. "How did we let this happen?" After the earthquake in January 2010 killed more than 250,000 people, injured another 350,000, and left 1.5 million homeless, the GHESKIO campus became home to a tent city of more than 7,000 refugees. When the worst cholera epidemic in recent history broke out a few months later, Deschamps and her colleagues pivoted, creating a vast community health outreach that went into the City of God where the cholera outbreak did its worst. To date, the hospital has treated more than 33,000 cholera patients and helped to immunize more than 50,000 at-risk residents of the City of God against the water-borne disease. Deschamps' latest project is a rehabilitation and training program for women (many of them survivors of sexual violence) where they learn an artisanal craft or skilled trade, such as sewing textiles, print making, mask making, and high-end carpentry--empowering women with actual power tools. Her energy and ingenuity, like her stubborn optimism, seem boundless. As our group left the hospital after a couple of hours, I flagrantly broke two cardinal rules of journalistic detachment: I hugged the good doctor and I got choked up. "Merci, Dieu, pour cette femme," I whisper-prayed in her ear. "Thank you, God, for this woman." But Deschamps isn't the her who hasn't left my mind since I left Haiti. The woman I can't stop thinking about is someone I never saw. On Sept. 25, our delegation, led by former U.S. Senate Majority Leader Bill Frist, visited a J/P HRO health clinic in Delmas. Frist is a medical doctor, heart-lung transplant specialist, and longtime champion of health care in the developing world. He was instrumental in the creation and passing in 2003 of the President's Emergency Plan for AIDS Relief (better known as PEPFAR), a program that has supported lifesaving anti-retroviral treatment (ART) for more than 9.5 million people worldwide. Frist's group, Hope Through Healing Hands, and CARE organized our "learning tour" of Haiti. The actor and activist Sean Penn, bless his heart, who spent many months living and working in a tent city on the golf course at Port-au-Prince's Petionville Club among 50,000 displaced Haitians after the 2010 earthquake, founded J/P HRO, which continues to do impressive work on numerous fronts, including health care--no small gesture in a country where an estimated 40 percent of the population has zero access to basic health care and nutritional services. While we listened to a doctor at the J/P HRO clinic talk about community outreach and maternal health, I thought I heard a woman cry out and then moan. It was a Sunday afternoon, so the urban clinic was not busy and, therefore, relatively quiet. I kept taking notes and asked a few questions in my limping French. Then I heard it again: the unmistakable, primal sound of a woman in the throes of labor. I couldn't see her, but I could hear her. I don't know her name or whether she gave birth to a boy or a girl or both. I don't know how old she is, whether it was her first childbirth, one of many, or her last. I don't know if she is married or single or a widow or divorced. I don't know whether she wanted the baby or if the thought of its birth terrified her. A week almost to the hour after our plane bound for Atlanta left Port-au-Prince, Hurricane Matthew arrived with its 145-MPH winds and misery, dumping an average of 20 inches of rain (and up to 40 inches in some areas) on an island where everything is unstable, from the government to the actual land itself--given to erosion and landslides after 200 years of rampant deforestation. 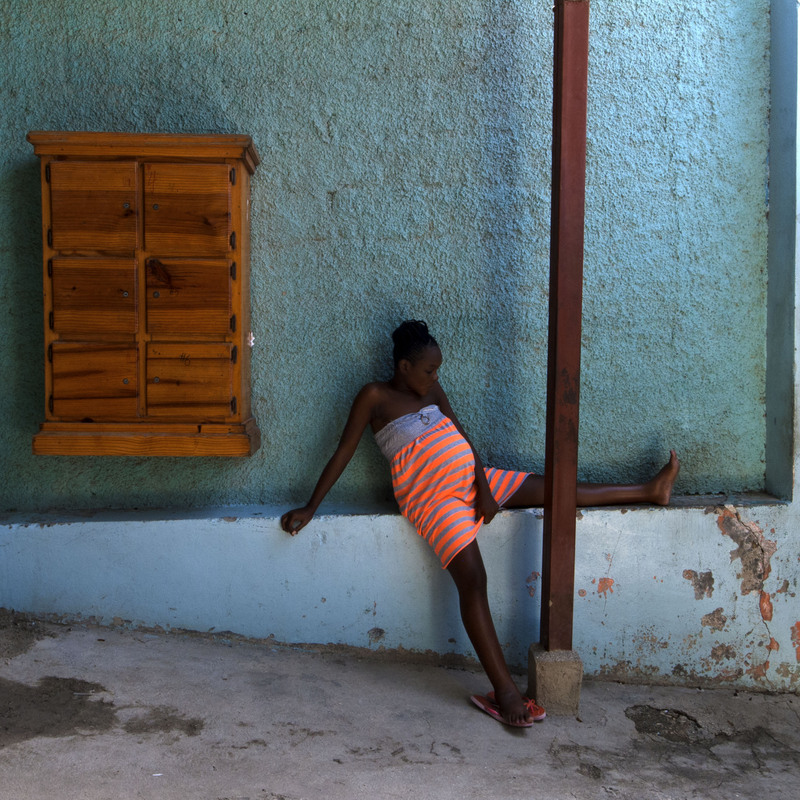 There is scant infrastructure in Haiti of any kind and the country is still struggling to find its footing nearly seven years after the devastating quake. The hurricane battered Port-au-Prince, but not as badly as it did the southern coast of the island where entire communities such as Les Cayes and Jeremie, were practically decimated. The death toll from Haiti's latest natural disaster has exceeded 1,000, an estimated 175,000 people are homeless (again), and the UN says urgent humanitarian aid is needed for 1.5 million Haitians--about 15 percent of the entire population. And as the flood waters begin to recede, standing water throughout the country means Haiti is bracing for yet another torrent of water-related diseases, including a potential cholera outbreak worse than the last, not to mention malaria and Zika. Back home in California, I've watched television coverage (such as it was and what remains) of the aftermath in Haiti. I've read the news, the analysis, and the pleas for aid from all quarters. (For suggestions about how and where to donate, click HERE or HERE.) In church and out, I've prayed for Haiti, for the people we met, and the millions more we didn't. The morning the hurricane hit, Laura Sewell, CARE's director in Haiti, told NPR there were 60,000 pregnant women in the country's south region alone. "What's going to happen to those women," she asked. What happened to those women? What happened to the woman laboring in Delmas the week before? I've sent emails asking after her. So far, no word. Still, I hear her courageously birthing new life and new hope into Haiti--a place too many people dismiss as hopeless. And I just can't stop thinking about her.